Nordic Studies in Education will only be published online from 2018 – NFPF/NERA, the main association for educational researchers in the Nordic countries. 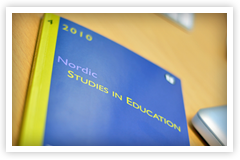 As of 2018 Nordic Studies in Education will be published only as an electronic-journal. As a member of NERA, you will get access to the journal online on the journal database Idunn, through our member site nfpf.net. You will also have access to the whole archive. This means that you can read all earlier volumes of the journal from 2002-2017, and the latest journal immediately when it is published. To access Nordic Studies in Education on nfpf.net, you will receive login information in February 2018, after you have paid the membership fee. Keep yourself updated on nfpf.net! You will find other useful information such as information about upcoming conferences, calls for special issues of Nordic Studies in Education, information about how to apply for network supports and more. NSE is published by Universitetsforlaget. If you have questions related to your membership, please contact abonnement@universitetsforlaget.no.